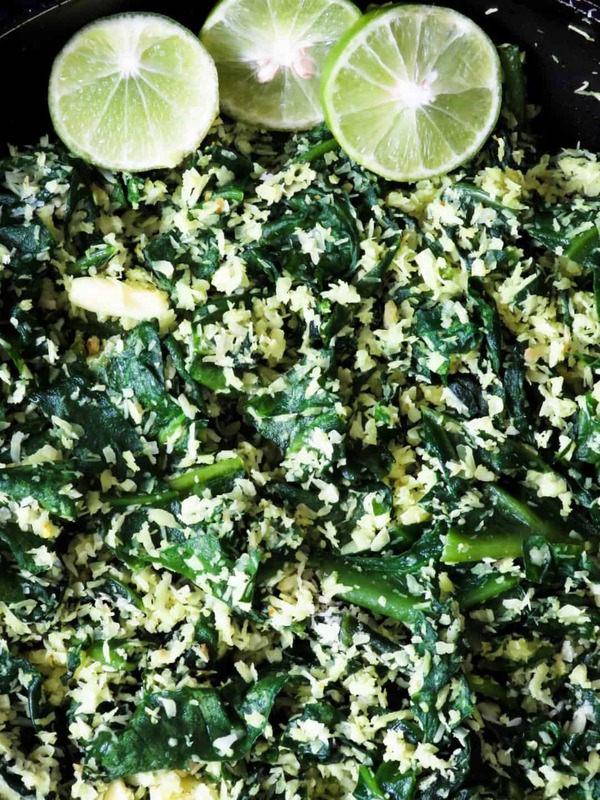 Sri Lankan spinach and coconut mallung(stir-fry,no oil used). Spinach and coconut mallung(Sri Lankan). a healthy recipe which fits into any diet, from gluten-free, vegetarian, vegan to even meat lovers who will want to have this dish to cool down their system and there’s no extra oil used except for the tiny bit released by the coconut. 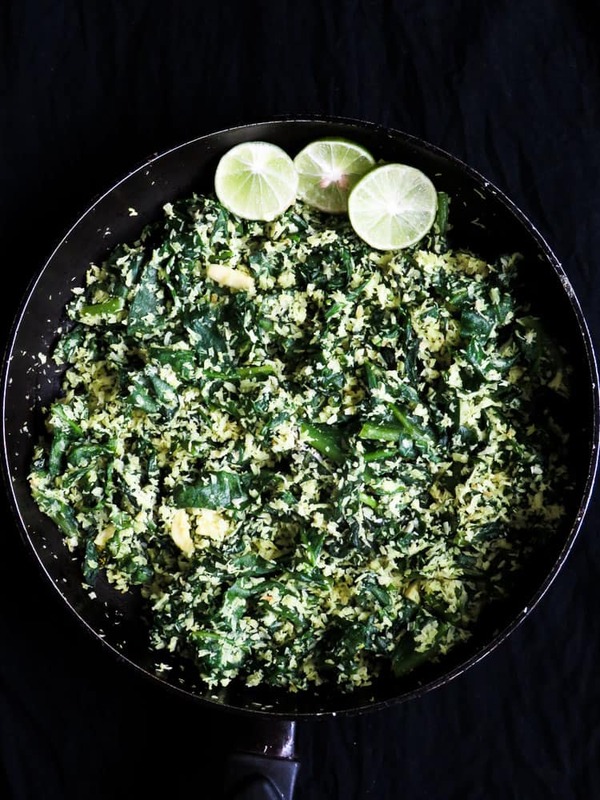 You’ve tried spinach in all the ways you can make, in your salad, in your smoothies, a topping over your soup but have you ever tried it as a Sri Lankan spinach mallung? One of the healthiest addition you’ll find in a Sri Lankan meal is a raw leafy salad, it’s the dish that rounds up all the flavors. The leafy bowl is guaranteed to be packed with nutrients because you’ll be eating it raw(well almost raw in the case of this spinach mallum). Writing about leafy Sri Lankan dishes, I can’t believe I’m using the same words my mama used when I refused to eat the gotukola mallung on my plate. “eat the greens they’ll, make your hair grow longer and skin glow” which sounded like blah blah to me at that time but is actually true when you think about it. I mean eating greens, especially the ones served at meals when we were young are the purest form of vitamins and nutrients. so if you can, try to get your young ones to eat a few spoonfuls a day. “mallung” referred here is a preparation of leafy vegetables into a kind of salad which can be raw or sometimes cooked for a few minutes. I haven’t the foggiest idea if there is an English word that can give the same meaning as “mallung” but if you do, please let me know so I can use it instead of calling it a stir-fry. Did you know, you are not supposed to reheat spinach? apparently, they release a kind of toxin, now I’m not sure if this a true fact or not but I thought I should mention it here, in case there are any leftovers and you decide to slightly reheat it like some people I know(ahem). 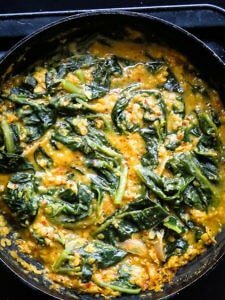 Can I use frozen spinach to make the mallung? I’m using fresh spinach that can be found in markets and sold in a messy bunch but you can definitely use frozen spinach instead. Since the spinach leaves were large, I had to cut them into large strips keeping in mind that they tend to reduce in quantity when they wilt for the heat. If you are using baby spinach or smaller leaves, you don’t have to cut them to size, just add them as they are. recipes to try- easy garlic kangkung stir-fry with toasted garlic. Can I substitute desiccated coconut for scraped coconut? I get asked questions from readers outside of Sri Lanka about certain ingredients so I’m always trying to adapt the Sr recipes that can be made outside of the country as some of the readers of the blog mention they have a hard time finding certain ingredients like scraped coconut. Unless you go to a specialty store that sells Srilankan ingredients, you might have a difficult time finding fresh, scraped coconut. keeping this in mind, I made the following mallung using desiccated coconut(not the powdered variety but with dehydrated flecks, in case you are wondering) and the mallung came out just fine. So, it’s a big YES!, you can use desiccated coconut BUT fresh, scraped coconut is always better. Optional ingredients to spice up the dish. Since I’m feeding a 7-year-old, I have to usually tone down the heat. for the spinach and coconut mallung I hardly used any spice but go ahead and add a teaspoon of chilli fleck, dried or green chillies when you make the mallung. If you’ve found the recipes posted here helpful in any way, then please subscribe to the blog, this is the only reliable way that I can keep in touch with you. Thank you again for your time and don’t forget, Subscribe for new recipe updates! 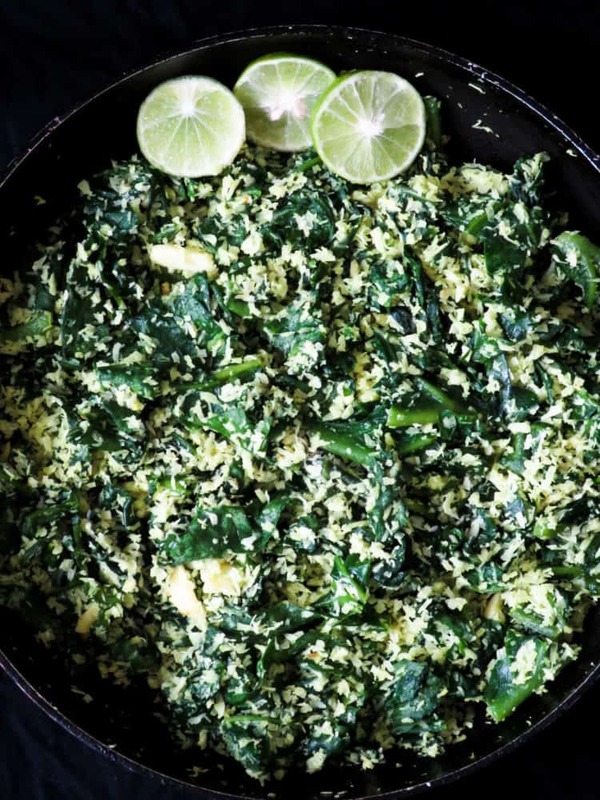 recipe-Sri Lankan spinach and coconut mallung(stir-fry). If you are buying the spinach from the market or the regular supermarket, thoroughly wash them under running water to remove any sand residues. Once washed, set them aside to drain excess water. if the leaves are large, cut them into strips and set aside. Place a flat-bottomed skillet over low fire and add the slivers of garlic into the pan and toast them for 2 minutes. Add the desiccated coconut to the pan and continue to cook on low fire for further three minutes while mixing the garlic and coconut together. Add the turmeric, salt to season, followed by the spinach leaves, increase the heat to medium and wilt the spinach for exactly a minute. 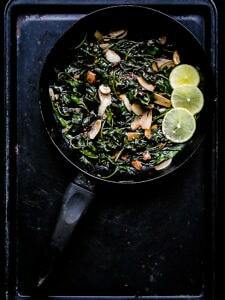 once the spinach slightly wilts, immediately remove the pan from the fire. SPINACH AND COCONUT MALLUNG(SRI LANKAN). 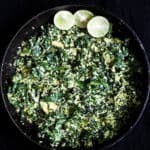 A HEALTHY RECIPE WHICH FITS INTO ANY DIET, FROM GLUTEN-FREE, VEGETARIAN, VEGAN TO EVEN MEAT LOVERS WHO WILL WANT TO HAVE THIS HEALTHY DISH TO COOL DOWN THEIR SYSTEM AND THERE’S NO EXTRA OIL USED EXCEPT FOR THE OIL RELEASED BY THE COCONUT. Unless you go to a specialty store that sells Srilankan ingredients, you might have a difficult time finding fresh, scraped coconut. keeping this in mind, I made the following spinach mallung using desiccated coconut(not the powdered variety but with dehydrated flecks, in case you are wondering) and the mallung came out just fine. Your recipes seems just mouth watering. In Awe with your cooking. Thank you, the main ladies in my life are way better than me Meenu, me, I count myself as an apprentice to them but appreciate your lovely comment.blessings.